Choose from a variety of accommodations from cozy studios to spacious one and two bedroom suites, as well as standalone cottages with breathtaking views of the Koolau mountain ranges or Kaneohe Bay. Each of our suites are beautifully renovated and furnished in contemporary island style, with modern conveniences. Our bathrooms each feature a free-standing vanity and a tub or shower. Pet-friendly rooms are available at an additional rate of $25 per pet per night. Maximum two (2) pets are allowed per room. Pet maximum weight is 70 lbs. Be sure to take advantage of the other resort amenities included in your stay; complimentary breakfast, wireless in-room Wi-Fi, and more. Included in your resort fee are: access to an outdoor pool/Jacuzzi, fitness room, BBQ grill and floating docks, kayak and snorkel equipment rentals, beach towels and use of safe (at front desk). Daily resort fee is USD $35 plus tax for the first two adults and USD $10 for each additional guest over 12 years old in the same room. No fee for children age 12 and under. Children 12 years old and under stay free with their parents using existing bedding. For the enjoyment of our guests, all of our accommodations are non-smoking. 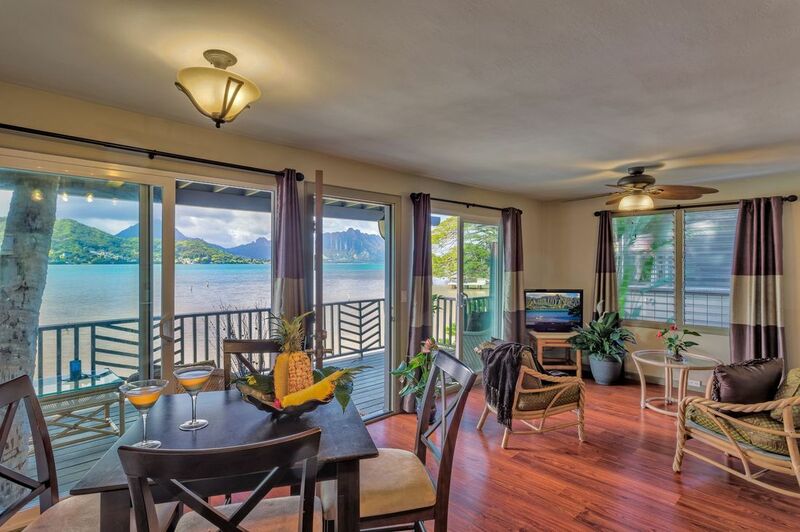 Choose from one- or two-bedroom waterfront cottages featuring panoramic views of Kaneohe Bay. Each of our cottages features a large private waterfront balcony, separate living room and bedroom, fully-equipped kitchen and other modern amenities. Stay in an affordable Classic Studio or upgrade to one of our popular studios with views of the breathtaking Ko'olua mountain ranges or Kaneohe Bay. Our studios range in sizes from 300-400 square feet and can accommodate up to two adults. Ranging from 320-550 square feet in size, our spacious 1-bedroom suites can accommodate up to 3 persons with a rollaway bed (fee applies). Choose from an affordable 1-bedroom classic suite or treat yourself to an upgrade to our 1-bedroom suite with mountain or bay views. Each 2-bedroom suite has a separate living room and two bedrooms furnished with a King bed in each. Room size is approximately 600-700 square feet and can comfortably accommodate up to four adults. Limited availability. Perfect for guests who are looking for temporary housing or staying for an extended period while on Oahu, these spacious 2-bedroom units offer the comforts of "home away from home" at affordable prices. Each unit can accommodate up to four adults. All Ohana units are pet friendly & TLA approved.